Interstate 476 begins at Interstate 95 in urban Chester, Pennsylvania. The commuter freeway extends north along the Mid-County Expressway through the western suburbs of Philadelphia, to I-76 at Conshohocken and the Pennsylvania Turnpike (I-276) at Plymouth Meeting. This stretch of freeway is locally known as the “Blue Route”, a nickname referencing the alignment selected during the planning process for the route. Ramp meters operate along the route as well. Northward from Interstate 276, I-476 overlays the Northeast Extension of the Pennsylvania Turnpike to Allentown, Wilkes-Barre, Scranton and Interstate 81 at Clarks Summit. The tolled portion of the route serves both commuters in Montgomery County and travelers bound for the Pocono Mountains in northeastern Pennsylvania. Originally only 21 miles in length, the initial length of the “Blue Route” was fully approved by AASHTO on June 9, 1991 after completion of Interstate 476 between I-95 and Conshohocken. The freeway retained this length for less than five years, as further extension was approved in 1996 north to the vicinity of Scranton. 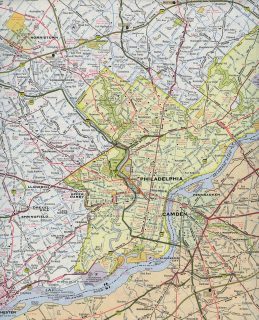 At that time, I-476 became the longest three-digit Interstate highway in the system with approximately 130 miles. The route surpassed the previous longest three-digit Interstate route, I-495 around Boston, Massachusetts. Furthermore, several two-digit Interstate routes, such as I-12 in Louisiana, I-19 in Arizona, and I-97 in Maryland are all shorter than Interstate 476. The Northeast Extension section of Interstate 476 travels west of former U.S. 611 between Philadelphia and Scranton. U.S. 611 was decommissioned in 1972, with portions of the route renumbered as PA 611 and PA 435. U.S. 309 paralleled the Turnpike north from the Fort Washington Expressway to Quakertown before crossing paths with I-476 at Allentown. Downgraded to a state route in 1968, the historic U.S. highway looped west and north from the Interstate 476 corridor to Hazleton and Wilkes-Barre. U.S. 11 runs along I-81 within the vicinity of I-476 between Wilkes-Barre and Scranton. 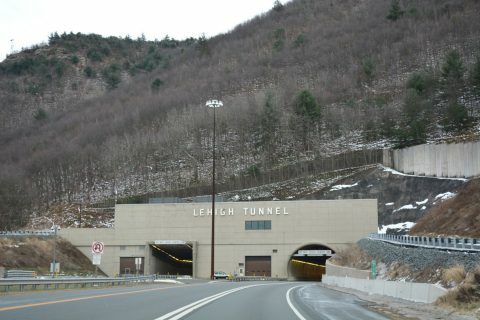 The Lehigh Tunnel carries Interstate 476 (Pennsylvania Turnpike Northeast Extension) under Blue Mountain. Opened in 1957, the tunnel consisted originally of just a single bore, with one lane of traffic in each direction. A second bore was added during construction from 1989 to November 1991. The tunnel (and the rest of the Northeast Extension) became a part of Interstate 476 in fall 1996. Photo taken 12/19/16. Prior to 1964, the Pennsylvania Turnpike mainline and Schuylkill Expressway in Philadelphia were designated as Interstate 80S. As such, the branch routes in the Philadelphia area were proposed as I-280 for the Pennsylvania Turnpike east from Valley Forge (current I-276), I-480 for the Mid-County Expressway (I-476), and I-680 for the loop through South Philadelphia and across the Walt Whitman Bridge (I-676, before I-76 switched places with I-676 along the Vine Street Expressway). Construction of the remaining Mid-County Expressway, however, would be placed on hold until 1985 due to red tape and community opposition.2 Thus, several compromises were made to the overall design of the highway between Interstates 76 and 95. Of these, various sections were redesigned to better blend into the natural landscape, with the southernmost portion of highway reduced in lanes from six to four. If it were not for these changes, the highway project may have been scrapped. The southern terminus interchange with I-95 was constructed in 1975. It was not used by drivers until August 17, 1988,2, when the MacDade Boulevard connector, a three-quarters of a mile segment of freeway linking I-95 with MacDade Boulevard at Woodlyn, opened to traffic. Signs for at the semi-directional T interchange referenced “To MacDade Boulevard” until December 19, 19912, when Interstate 476 was completed between MacDade Boulevard (Exit 1) and I-76 (Exit 16). This action removed the bottleneck along PA 9 and was the catalyst to redesignate the Northeast Extension as an Interstate Highway. The extension of Interstate 476 was initially disapproved by AASHTO on November 11, 1994, due to concerns about the designation “476,” the somewhat substandard design of the route, and the lack of Federal Highway Administration approval. 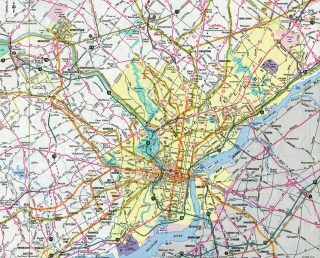 To that end, transportation planners again submitted plans to unify the entire route under one number, and on April 23, 1995, AASHTO approved the extension of Interstate 476 from I-276 north to I-81 near Dickson City via former Pennsylvania 9. The Interstate designation was approved by the Federal Highway Administration on November 1, 1996, and signs were erected immediately thereafter. The Interstate continuity provides traffic from the Interstate 95 corridor with a seamless link to Scranton and points north. 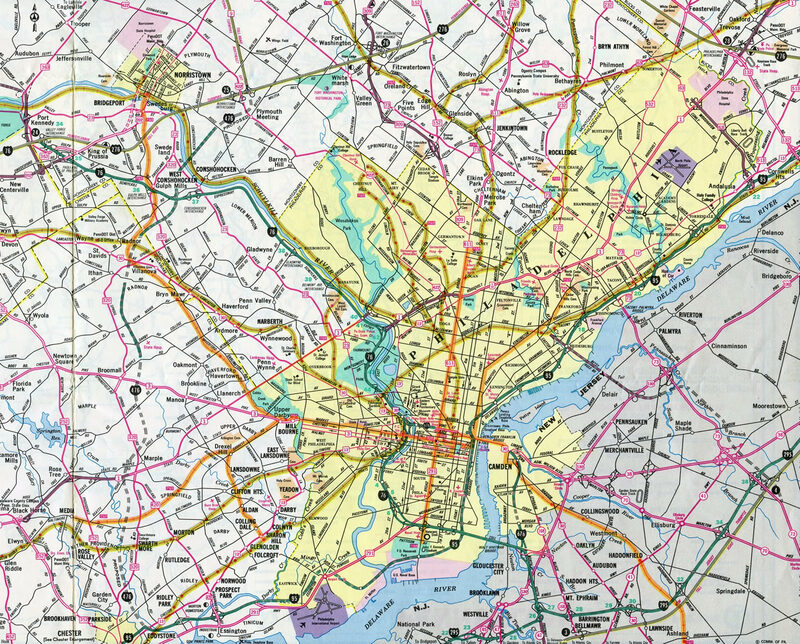 1961 map of Philadelphia showing Interstates 76 as 80S, 276 as 280, 476 as 480 and 676 as 680. As no section of the Mid-County Expressway predates the I-80S renumbering to I-76, I-480 was purely a paper designation. Three stretches of Interstate 476 were under construction by the mid-1970s. 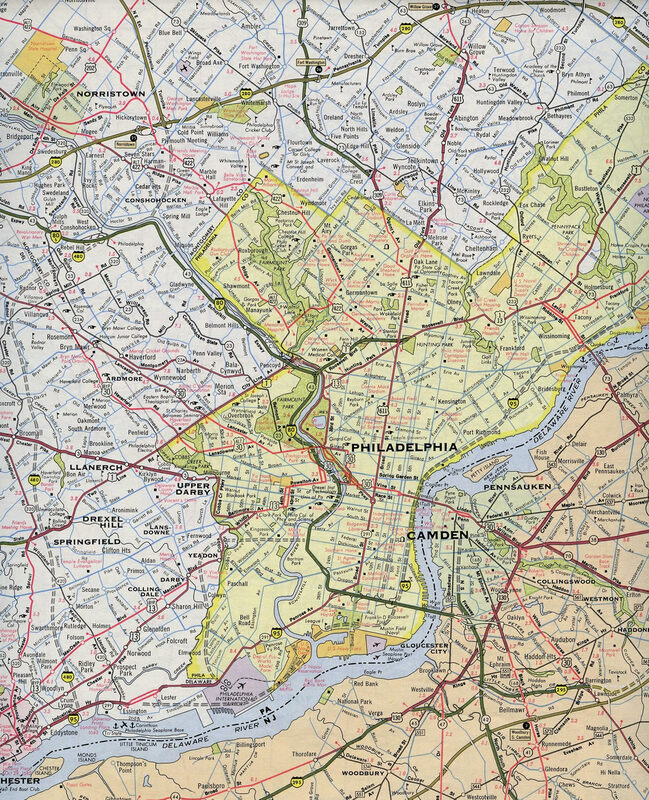 The sections south of I-76 would not open to traffic until 1991, while the northern portion, including a crossing of the Schuylkill River, opened in 1979. Shields for I-476 were added to button copy signs on the Pennsylvania Turnpike for the Norristown Interchange in the 1980s. 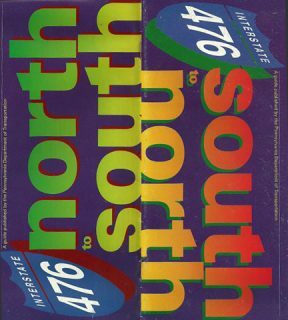 Exit brochures were distributed in late 1991 and early 1992 for the newly completed Interstate 476 through Delaware and Montgomery Counties. The maps displayed ramp configurations for each interchange and included a short history of the Blue Route. Ramp meters were activated at interchanges along Interstate 476 in 1996. Brochures were distributed to both educate the public of their operation and show their locations. A Breezewood connection joins Interstates 80 and 476 (Northeast Extension) at Kidder Township. Trumpet interchanges from both routes tie into access roads intersecting Pennsylvania 940 opposite one another. An array of traveler services line the state route nearby. Photo taken 12/19/16. Interstate 476 hooks northeast through South Abington Township on the final two miles of the Pennsylvania Turnpike Northeast Extension. Photo taken 09/27/09. The Clarks Summit Interchange connects I-476 with both Interstate 81 & U.S. 6 and parallel 11 as they travel through a valley by Bell Mountain southeast into Scranton. Photo taken 09/27/09. Interstate 476 curves southward to a mainline toll plaza preceding the trumpet interchange (Exit 131) with access roads to both Interstate 81 and U.S. 11. Photo taken 09/27/09. U.S. 6 uses the access roads with I-476 (Northeast Extension) to make the connection between overlaps with U.S. 11 north to Clarks Summit and I-81 south to Dickson City and its freeway to Carbondale. Photo taken 09/27/09. Following the access road (U.S. 6) east to Interstate 81, drivers partition for ramps south to Scranton and Wilkes-Barre and north to Binghamton and Syracuse. Photo taken 09/27/09. Traveling east of the boroughs of Clarks Green and Clarks Summit, Interstate 81 passes by several subdivisions on the two mile approach to Exit 194 with the Pennsylvania Turnpike access road (U.S. 6) for I-476 south and U.S. 11. All guide signs for Exit 194 on I-81 south were carbon copied to use Clearview font by 2012. Photo taken 07/04/05. Supplemental guide signs are posted in each direction of I-81 with the long distance control cities of Allentown and Philadelphia for the Northeast Extension. Bald Mountain appears on the southwest horizon as Interstate 81 nears the trumpet interchange (Exit 194) for I-476 (Northeast Extension) south. Interstate 476 crosses paths with I-81 again near milepost 181. The toll road provides a bypass of Scranton by following the east slopes of Bald Mountain. Photo taken 07/04/05. I-81 south crosses Leggetts Creek ahead of the off-ramp (Exit 194) for I-476 and adjacent U.S. 6 west & 11 north into Clarks Summit. Beyond Clarks Summit and Factoryville, U.S. 6 west & 11 north divide. U.S. 6 continues west toward Tunkhannock, Towanda, Mansfield and Wellsboro. U.S. 11 extends north to Binghamton, New York. Photo taken 07/04/05. U.S. 6 east enters Interstate 81 at Exit 194, using the turnpike access roads with I-476 to connect from U.S. 11. The US highway overlaps with I-81 southeast to Exit 187, where it departs via a freeway to Carbondale. Interstate 476 meanwhile bypasses Scranton to the west before shifting east of Wilkes-Barre en route to Allentown, 75 miles to the south. Photo taken 07/04/05. Interstate 81 & U.S. 6 circumvent Bell Mountain northwest from Dickson City to South Abington Township and the exchanges with Interstate 476 and U.S. 11. The two-mile sign bridge here was removed during construction to expand the freeway footprint outwards in 2014. Photo taken 07/01/05. Nearing Exit 194 for the Northeast Extension of the Pennsylvania Turnpike on I-81 north & U.S. 6 west. Traffic counts are generally low on Interstate 476 between the north end (Exit 131) and Exit 115 at Dupont. An interchange was constructed at Keyser Avenue (Exit 122) to add to the appeal of the lightly traveled highway. Photo taken 07/01/05. Motorists span Scott Road on the one mile approach to Exit 194. U.S. 6 west splits with I-81 north to utilize the three trumpet interchanges joining the north end of I-476 with I-81 and adjacent U.S. 11. Photo taken 07/01/05. Northbound Interstate 81 reaches the off-ramp (Exit 194) for U.S. 6 west to I-476 south and U.S. 11. U.S. 6 was realigned onto Interstate 81 when the freeway opened between Interstates 81, 84 and 380 and Carbondale by 2000. North from Scranton, I-81 advances 50 miles to I-86 outside Binghamton, New York. Photo taken by Chris Elbert (07/06). Traffic from both I-81 north and south bound for I-476 combines ahead of a trumpet interchange with the Northeast Extension mainline. 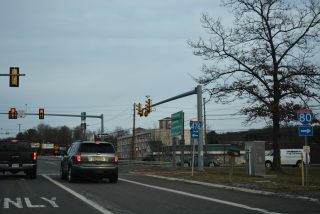 The immediate ramp leads south to Wilkes-Barre while U.S. 6 uses the second ramp to follow the ending turnpike mainline at U.S. 11. Photo taken by Chris Elbert (07/06). U.S. 6 east follows U.S. 11 south through Clarks Summit to the trumpet interchange with the Northeast Extension end. A single lane of traffic leads the US route north to the access road linking the PA Turnpike with adjacent I-81. Interstate 476 south otherwise passes through a main line toll plaza before swinging southwest to Bald Mountain. Photo taken by Chris Elbert (07/06). 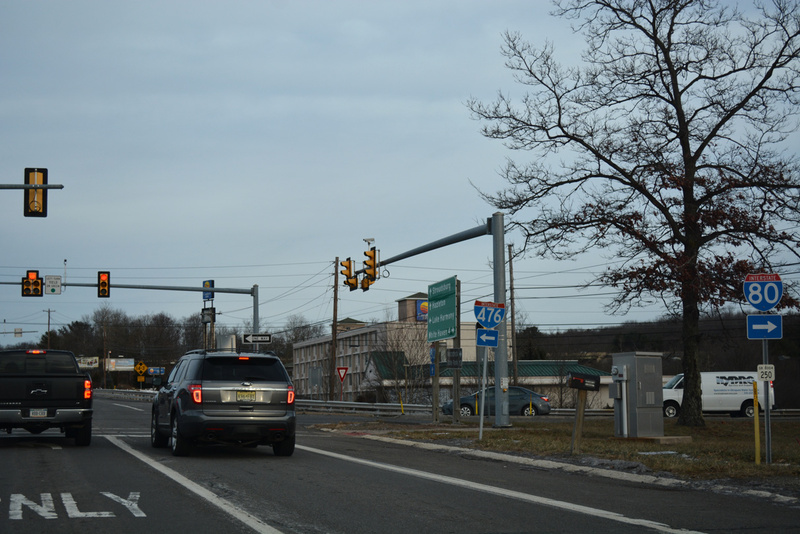 Exit 1 leaves Interstate 476 south for MacDade Boulevard. Two lanes advance south to I-95. Photo taken 12/20/17. Ramps from MacDade Boulevard intertwine with the southernmost extent of Interstate 476 as it splits into two lane ramps for Interstate 95 south through Chester and north to Philadelphia International Airport (PHL). Photo taken 12/20/17. Milepost zero stands along the connection from I-476 south to I-95 north. Photo taken 12/20/17. Interstate 95 travels below grade through northern reaches of Chester as it approaches the south end of I-476 (Exit 7). The northbound freeway sees a lane drop for the Mid-County Expressway flyover ramp. Photo taken 12/24/16. An on-ramp from Chestnut Street adds weaving traffic to Interstate 95 north ahead of the semi-directional T interchange (Exit 7) with Interstate 476 north. This area is commonly a choke point for traffic during commuting hours. Photo taken 12/24/16. An arrow-per-lane (APL) sign was added for Exit 7 on December 16, 20153 to reflect the expansion of the northbound ramp to two lanes. Photo taken 12/24/16. Replaced guide sign for Interstate 476 (Exit 7) on I-95 north ahead of the PA 352 (Edgmont Avenue) overpass in Chester. Signs for I-476 north omit Media and other Chester County suburbs in favor of Plymouth Meeting, the junction point with Interstate 276 and the Northeast Extension. Photo taken 07/27/07. The 1975 design of the exchange with I-476 results in a bottleneck along Interstate 95, where the freeway reduces from six lanes to four from the south. Clearview-font based overheads replaced signs at the Melrose Avenue overpass by 2012. Photo taken 05/07/05. Northbound drivers along I-95 span both Ridley Creek and Bullens Lane leading to the Exit 7 gore point with Interstate 476 north. This ramp opened to local traffic in 1988 to MacDade Boulevard. Photo taken 05/07/05. Interstate 95 passes through the diamond interchange (Exit 8) with Stewart Avenue with four southbound lanes. A diagrammatic sign outlines the forthcoming split with I-476 north, where the I-95 mainline reduces to two through lanes. Photo taken 06/03/12. Spanning the AMTRAK Northeast Corridor, I-95 shifts northward into the semi-directional T interchange (Exit 7) with Interstate 476. The Blue Route leads commuters north to Media, Springfield and Wayne among other suburban communities. I-95 south passes through the industrial city of Chester on the 11-mile drive to Wilmington, Delaware. Photo taken 12/20/17. Two lanes veer away from Interstate 95 south for I-476 north leading directly to MacDade Boulevard near north Chester and Woodlyn. Interstate 476 winds northward with four lanes to PA 3 at Broomall and six lanes from there to Plymouth Meeting. Photo taken 12/20/17. Sign changes made along I-95 south by 2015 added exit only placards for Interstate 476 north. Photo taken 06/03/12. Overheads for I-476 north previously displayed state-named shields for the Mid-County Expressway. Original concrete along I-95 at the exchange was paved over with asphalt in 2007. Photo taken by Chris Mason (06/23/02). Interstate 95 south at the double lane drop for I-476 (Exit 7) north. Sign changes here added an exit only placard. Photo taken 06/03/12. newsletters/summer98/page-4.htm by Lowman S. Henry. “Travel Restrictions Scheduled on at I-95/I-476 Interchange in Delaware County.” Pennsylvania Department of Transportation District 6, news release, December 11, 2015. “Blue Route ramp meters back in operation.” Delaware County Daily Times, February 25, 2010. “Scranton Beltway taking next step.” The Times-Tribune (Scranton PA), December 6, 2016. “PA Turnpike Celebrates Opening of Route 903 ‘E-ZPass-Only’ Interchange.” Pennsylvania Turnpike, press release. July 7, 2015. Page Update December 20, 2017.